you want to see in the world! Today we teacher went back to school to meet and greet and work on our classrooms preparing ourselves for another fun-filled year surrounded by the growing minds of children. My principal Debbie Barnes and our 3rd Grade Teacher Gen Bentley found this great video to get our school year off to a positive start! Such a great message! 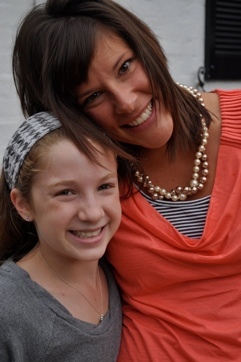 Here I am with one of my very favorite girls in the world on the first day of school! Previous postLong time no blog…this is so blog post worthy! I wanted to thank you for pointing the way to Angela Maeirs talk last week on Twitter! I found it to be very powerful and having been spreading the word. Posted about it too! Have a wonderful school year! Follow me on Twitter! Click here! All these posts, opinions, stories and reflections you find here are well-intentioned. I began this blog to share what was happening in my classroom with my students and now that I have my own blog through my school http://blogs.bannockburnschool.org/lbeversdorf ...I am truly I am just trying to share a snapshot of my mind at a certain point in time on a certain theme or topic, and maybe connect, share, collaborate or have a reader be able to empathize or feel what I was feeling or thinking. That's it. So please feel free to agree or disagree, compliment or complain about any thing I write. That is what this blog is for. These are my opinions, stories and reflections and while I feel and think them right now they may change...that is what we humans do. We think, we reflect, we learn, we evolve. Most everything you will read here will be very "Polly Anna," as some of my colleagues/friends refer to me. Just about everything I share here will be very positive and happy so LOOK OUT cynics! Come, read, comment and teach ME!